Tag Heuer has announced a pair of glasses called "Night Vision," designed with the driver in mind. First off, these aren't night vision. 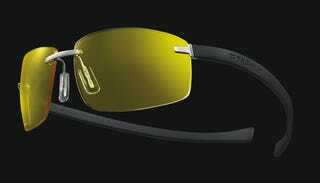 Night vision is something worn by covert ops in badass espionage flicks. These are low-light glasses. The glasses have been optimized for driving at night thanks to some engineering that corrects low-light and short-sightedness situations that usually occur in evening driving. These glasses were originally developed for the24 Hours of LeMans, but Tag Heuer went ahead and said "eff it" and slapped a price tag on these bad boys as well. The glasses will be available in wide and panorama styles. (Boonton, NJ...March 2008) - A revolution that can be appreciated on the track as well as on the road - TAG Heuer "Avant-Garde" Eyewear has developed innovative glasses exclusively for drivers. Aptly named "Night Vision," these glasses correct the low-light short-sightedness that everyone endures from twilight to sunrise. "Night Vision" eyeglasses optimize precision and enhance perception of contrasts for more comfort while driving at night. Featuring "TAG Heuer Reflex-type" flexible temples, they are adjustable and fit comfortably under motorcycle and racing helmets. Originally inspired by and developed for the internationally renowned 24 Hours of LeMans sports car endurance race, TAG Heuer Eyewear plans to market their purpose-made "Night Vision" eyeglasses via real racecar drivers. You'll see them on Formula One racer Sebastien Bourdais and Indianapolis 500 driver Sarah Fisher. These innovative glasses will be available to the public in early 2008. The titanium Night Vision frames are available in both Wide and Panorama, with anti-slip elastomere arms. Their pale yellow lenses offer constant clear, sharp vision with a very high light transmission rate in order to contrast dark blue and green surroundings without changing color perception. The special ophthalmic lenses offer an anti-reflective treatment, which reduces glare and offers more accurate sight. A driver's essential: these glasses are designed to maximize performance from dusk to dawn. TAG Heuer - maker of high-end sports watches and chronographs since 1860 - has been applying the same standards for design and quality found in their timepieces to the creation of exceptional eyewear since 2002. All TAG Heuer Eyewear lenses are shatter-resistant, ultra-light and provide 100% UV-A and UV-B protection.